It seriously has a lot of use and it's known to be a very very good moisturiser. I use it almost every night (almost because sometimes i am erm ... lazy) to moisturise my lips. Like seriously, lips crack/chap very easily zzzz. I used the one in the above pic. I know it comes in lotion form or a lip balm? Yeah but so far i only used this. 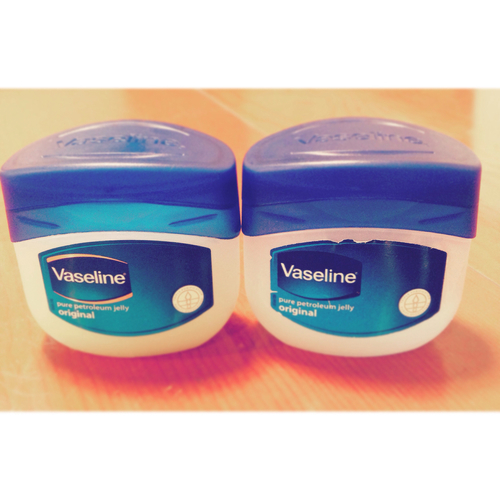 By the ways guys, i am blogging about this because i have seen/heard of/been trying some of the hacks or diy stuff that you can do with vaseline. Like apply it at the areas around the outside of your nails so when you apply nail polish, it will not stain your fingers/easier to wipe it off. Recently i tried applying vaseline on my eyelash. Yeah, i heard from a youtuber that she has been using this method and it works for her. Btws, her eyelashes are really really pretty omg #dreamlashes. Then like yesterday i watched another youtube video and the youtuber said that we should not apply vaseline to our eyelash. Because its too strong or moisturising for our eyelashes or something? Vaseline is really cheap anws and there are really those big size ones which will probably lost for a damn long time. I sound like advertising siah but i am not LOL. Just suddenly felt that vaseline can be used for a lot of stuff (how many times have i typed 'vaseline' in this post wtf).